Desserts have long been homegrown pastry queen Janice Wong’s calling card. From being the chef-owner of sweets-centric restaurant 2am: dessertbar, to being crowned Asia’s Best Pastry Chef at the Asia’s 50 Best Restaurants awards ceremony — twice in a row — Wong is well-known for her elaborate, decadent confections. But local foodies can now see (and taste) the savoury side of her culinary talent at Janice Wong Singapore, her newly-opened, full-fledged restaurant at the National Museum of Singapore. The flagship establishment offers an extensive range of dim sum and Modern Chinese cuisine alongside Wong’s signature desserts. 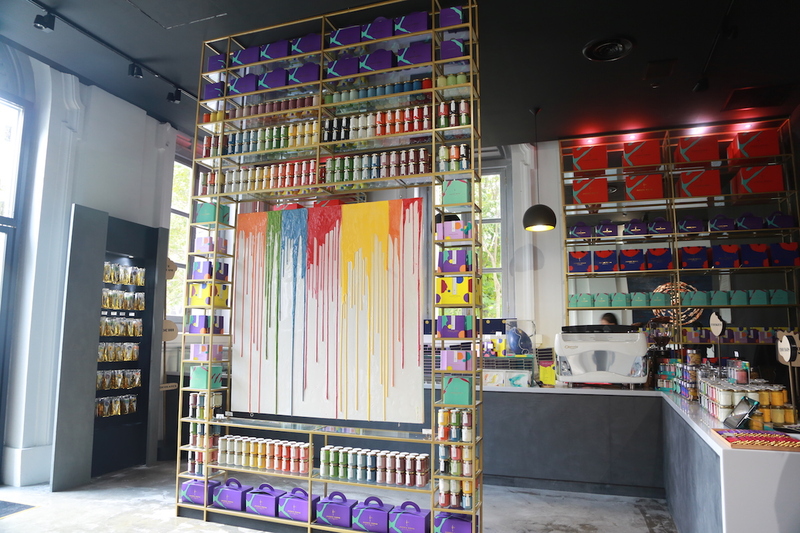 Edible paints take centre stage at the retail corner of Janice Wong Singapore. Tucked away in a quiet corner of the museum, Janice Wong Singapore is set in a 1,500 sq-ft premises formerly occupied by Chef Chan’s Restaurant. Upon stepping in, diners are greeted by a tall rack of vibrantly coloured edible paints — all of which are made from chocolate and offered in 38 flavours such as passionfruit and green mango. 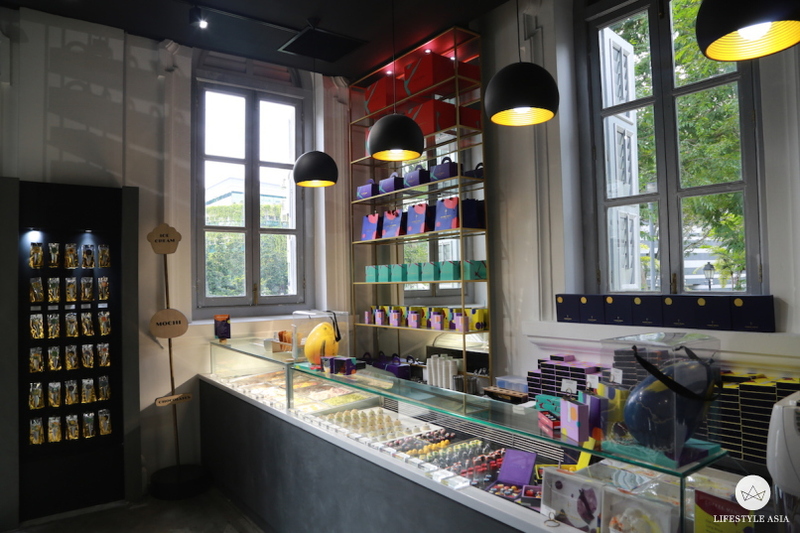 This leads to the eatery’s retail section, which is well-stocked with an assortment of brightly-hued chocolates, mochi and ice cream (which is made in-house daily). There is also a wall lined with chocolate lollipops. Take your pick from the tempting assortment of colourful chocolates, ice cream and mochi on display. Much thought has also gone into the dining area, which is furnished in mostly black, white and grey with brass and gold accents. It is furnished with jigsaw-inspired tables that are painted with chocolate and, when pushed together, form a giant chocolate bar. Hanging on the walls are whimsical giant paintings coated with chocolate, marshmallow and gummy candy. The whole restaurant seats 40, including a bar counter for those who prefer watching the chefs in action. It’s linked to the museum’s new digital exhibition space, which is slated to launch in October. When the space officially opens, patrons can enjoy their food while perusing the art displays. The savoury cuisine at Janice Wong Singapore is mostly Modern Chinese, with a focus on dim sum and noodles. These are prepared by Chef De Cuisine Ma Jian Jun, who previously collaborated with Wong on her 2013 cookbook Dim Sum: A Flour-Forward Approach To Traditional Favorites And Contemporary Creations. 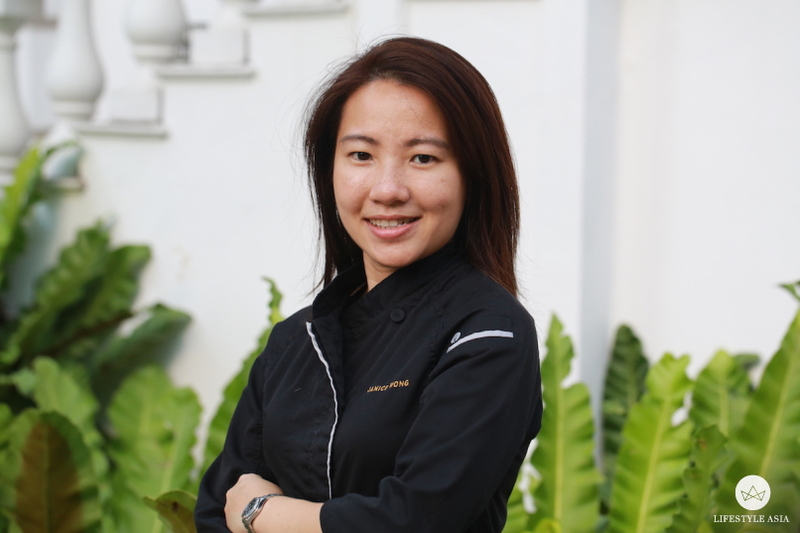 Award-winning local chef Janice Wong is known for her elaborate desserts. According to Wong, the savoury fare focuses on highlighting different variations of flour such as corn meal, potato starch and barley. In fact, every dish in the menu is helpfully labelled with its gluten content or the type of flour used. “I want to showcase the flour used in the dim sum skins, which I find so underrated,” she says. With so much talk about Wong’s dim sum creations, we simply had to try some for ourselves. So we began our meal with the Mini Pots (S$15), a trio of siew mai wrapped in vivid duo-coloured skins and available in flavours of shrimp with ikura, scallop with olive oil caviar, and portobello rosemary with caviar. Following several less-than-stellar encounters with overly doughy siew mai skins at other dim sum establishments here, we were thrilled to discover that Wong’s versions came ensconced in thin skins that weren’t too doughy, with the perfect skin-to-filling ratio. Feast on scrumptious, unusual siew mai. Our favourite was the vegetarian-friendly portobello option, which came wrapped in a red and purple skin, and was generously packed with aromatic bits of the mushroom. For an extra dash of indulgence, it was topped with salty black caviar. 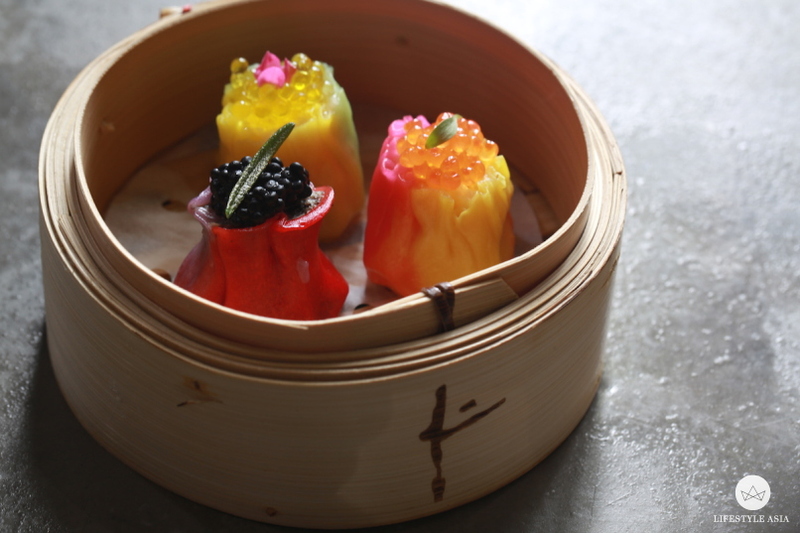 Also worth ordering was the pink-yellow shrimp siew mai, which comprised sweet, succulent chunks of the crustacean topped with bouncy ikura pearls. Another must-try is Wong’s rendition of xiao long bao (steamed soup dumplings), which are offered in unconventional flavours such as whisky pork, foie gras pork cherry and truffle cheese chicken. We were won over by the latter, a delectable blend of chicken and gooey cheese drenched in a comforting truffle-infused broth (S$15-S$21). Its skin was on the thick and chewy side, but the tasty filling inside more than made up for this. All the xiao long baos are available in sets of four and six, as well as part of a tasting platter where diners get to try the four different flavours. The Signature 5. Dumplings have never looked this good. 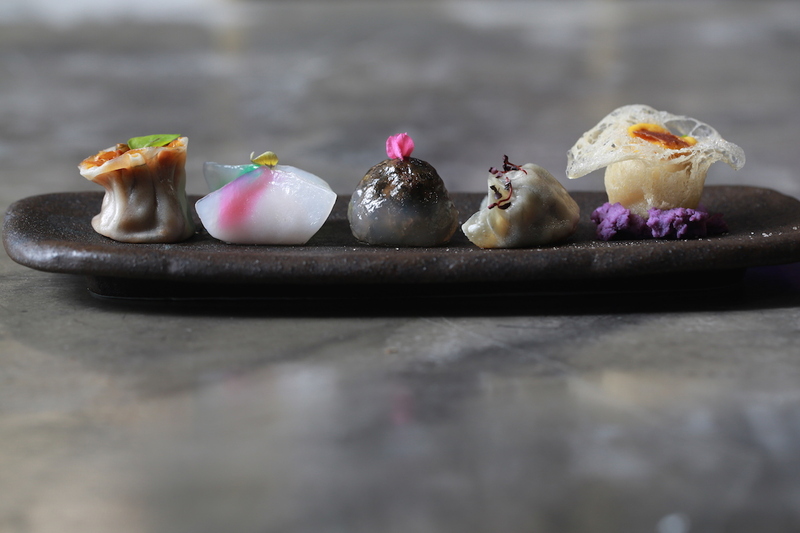 Next to arrive was the Signature 5 (S$15), a platter of five dumplings stuffed with assorted fillings such as mushroom, aubergine peppers and potato, and showcasing contrasting textures with their different skins ranging from crispy to chewy. The most memorable was the scallop and prawn crystal dumpling, which had a rather ordinary filling but made for an Instagram-worthy photo, thanks to its delicate skin embellished with pretty dabs of colour. Less visually-arresting but no less delicious was the mushroom dumpling, which comprised juicy, fragrant chunks of mushroom packaged in a slightly gummy, transparent skin. For our main course, we lapped up a bowl of the bizarre-sounding Crispy Charcoal Nest (S$22), a medley of homemade charcoal noodles in a thick, flavoursome broth. 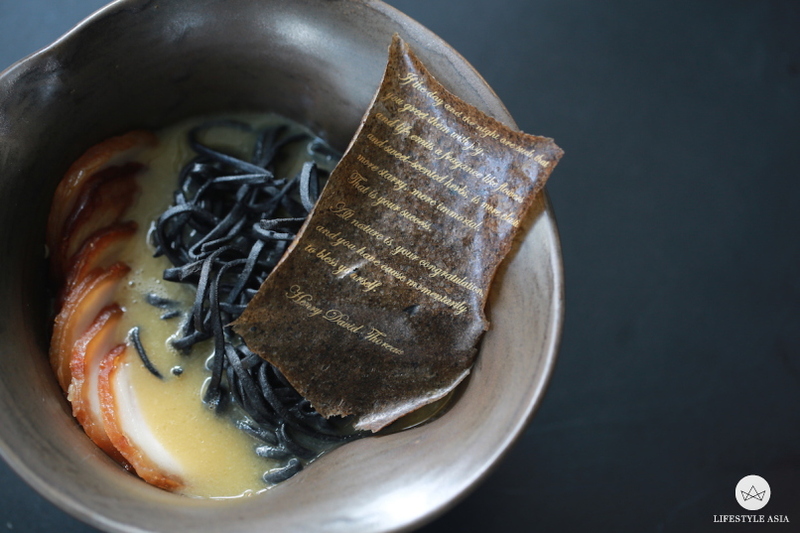 True to Wong’s penchant for the unpredictable and unusual, the ramen-inspired dish was at first presented dry and looked like, well, a nest of noodles. It was accompanied with tender slices of pork belly and a flattened mushroom printed with Wong’s favourite poem from writer Henry David Thoreau. As a finishing touch, the yellow collagen-rich chicken soup was poured into the bowl at the table. 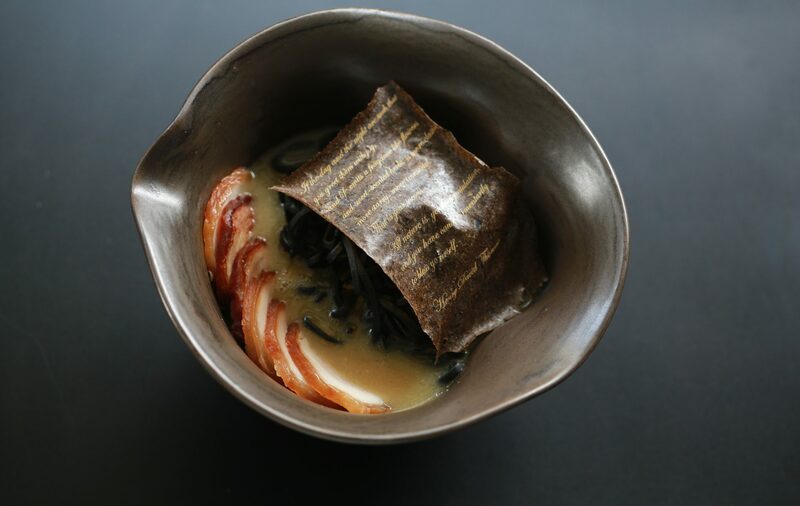 Photogenic and delicious, we couldn’t resist finishing up every bite of the charcoal noodles in collagen-rich broth. We particularly enjoyed the springy noodles and addictive broth, which tasted savoury at first, before taking on a sweeter flavour profile as it soaked up the juices of all its various ingredients. The pork belly slices were also silky smooth and wonderfully fatty, making this dish all the more satisfying. Despite all the earlier hearty offerings, we made sure to set aside some space for Wong’s famed sweet treats. We tried the Cacao Forest ($24), a mouthwatering concoction of Earl Grey Bergamot chocolate mousse with a centre of cherry and fruits of the forest. A scoop of vanilla whisky ice cream on the side added an indulgent boozy twist, while surprise bits of miso scattered on the plate cut through the sweetness with bursts of saltiness. If that’s not decadent enough, the confection was surrounded with a cloud of cotton candy, which was drenched with Creme De Cacao liqueur at the table. 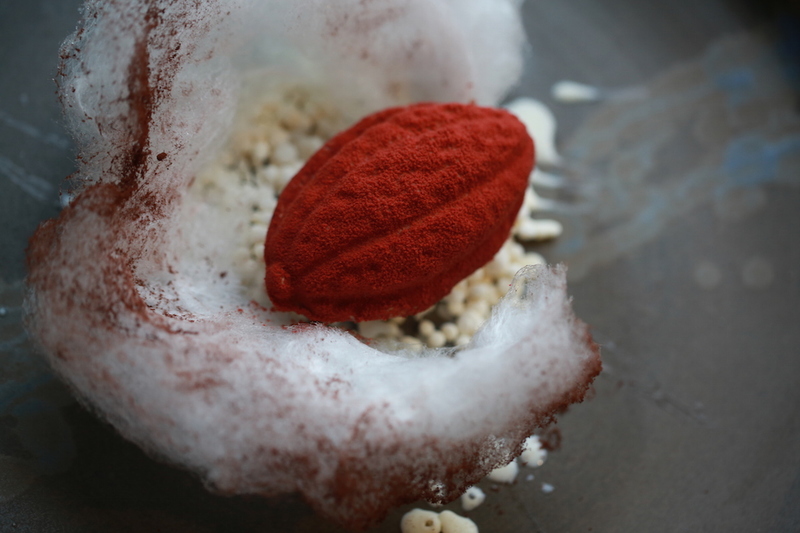 Save some room for Wong’s tantalising desserts, such as the gorgeous Cacao Forest. Janice Wong Singapore is pretty much a modern-day Willy Wonka’s factory, with its meticulously crafted offerings that run the gamut of sweet and savoury. Its retail space also had us feeling like a five-year-old in a candy store, with its whimsical creations such as chocolate balloons and edible paints. But we really like about the restaurant is that it highlights Wong’s versatility as a culinary visionary, beyond her forte in desserts. The savoury dishes, all of which are conceptualised and designed by her, are scrumptious and beautifully presented. They are also a refreshing change from the usual, old-school Cantonese dim sum with their unconventional flavours. Clearly, Wong is on a roll this year. Apart from her eponymous restaurant, she recently opened Cobo House by 2am: dessertbar in Hong Kong, which also serves sweet and savoury food, as well as Janice Wong Dessert Bar in Tokyo. In November, she will showcase her desserts at the 2016 Margaret River Gourmet Escape food festival in Australia.